Primary varicose veins are a common affliction of the lower extremities whereas the upper extremities are rarely affected for reasons not clearly understood. The literature has little reference as regards the number of cases and management of upper limb varicose veins. Treatment of upper limb varicosities is similar to that of lower extremity, that is the ligation and stripping of the varicose veins. Here we present a case of a 21-year-old male with this unusual condition of primary varicose veins of the upper extremity. Diagnosis in our case was made by means of physical examination and venography. The patient was surgically treated by ligation and stripping of the varicose cephalic vein from elbow to wrist with excellent functional and cosmetic outcome. Primary varicose veins of the upper extremity are extremely rare but present similarly to the lower extremity varicosities and are likely to have the same cause. The diagnosis of upper extremity varicose veins can be made by means of a good history and physical examination, besides, non invasive testing like duplex scanning are very helpful. Arteriovenous fistulae used as vascular access procedures especially for haemodialysis besides congenital vascular anomalies are recognized causes of upper extremity varicosities. Treatment is similar to that of varicose veins in the lower limbs. Besides, sclerotherapy may be used as an alternative to surgery. A healthy 21 year old man reported to our hospital with chief complaints of long standing swellings (more than ten years duration) of left forearm which were progressively increasing in size and number for few months. Occasionally they were associated with pain and discomfort. Patient did not give history of antecedent trauma or weight lifting. On examination there were multiple soft, cystic, compressible swellings 2 x 2 cm on the lateral aspect of left forearm along cephalic vein distribution [Figure - 1], which reappeared on relieving the pressure. Surrounding skin was normal with no hemangiomas. Bilateral pulses were normal, no bruit was audible and arms were of equal size. Swellings disappeared on raising the arm above the head. There were no varicosities on the hand and above the elbow. Opposite upper limb and bilateral lower limbs were normal. 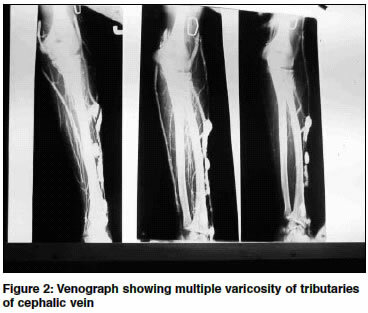 There was no history suggestive of lower limb varicosities or family history of varicose veins. Ascending phlebography was obtained which recorded cephalic vein varicosities with saccular enlargements [Figure - 2]. On duplex examination there was no evidence of venous reflux or proximal dilation. The patient underwent successful treatment of varicose veins by excision of cephalic vein from elbow to wrist under general anesthesia. Post operative recovery was uneventful. Follow up at 2 months showed no residual or recurrent varicosities. Histopathological appearance was consistent with varicose veins. A varicose vein may be defined as a vein that becomes elongated, dilated, tortuous, pouched and thickened due to continuous dilatation under pressure. Primary varicose veins are the ones which develop due to intrinsic valvular incompetence and have no apparent underlying cause. Secondary varicose veins form due to outflow obstruction, valve destruction secondary to deep vein thrombosis or because of arterio-venous fistulae. O′ Donoghue and Leahy have quoted the prevalence of visible tortuous veins as 10-15% in males and 20-25% in females. When non saphenous varices are included, approximately 45% of men and 50% women have varicose veins. Presumably the cause of upper extremity primary varicose veins is the same as lower extremity varicosities that is collagen defects in the vein wall resulting in weakness and dilatation. Among the other factors, primary valvular incompetence caused by floppy value cusps is well recognized as a cause of deep venous reflux. This condition exists in the superficial system as well with the resulting reflux leading to venous dilatation. It has been seen that the thin walled arm veins so rarely become varicose when compared with those of the lower extremity. Apparently the increased hydrostatic pressure transmitted to the lower extremities in the standing position plays a predominant role in the formation of varicosities and is not seen in the upper limb. Amongst congenital vascular anomalies, the Klippel Trenaunay Syndrome and the Parkes Weber Syndrome are rare causes of arm varicose veins. Congenital arteriovenous fistulae or A-V fistulae for haemodilaysis cause upper extremity varicose veins. Venous outflow obstruction caused by subclavian vein thrombosis can be another uncommon cause. The diagnosis of upper extremity varicose veins can be made with a good history and physical examination besides investigations like non invasive duplex. The color flow Doppler Ultrasound or non invasive duplex allows visualization and quantification of incompetence or obstruction. With the availability of this modality, more invasive investigations are generally unnecessary but may be required in unusual situations like congenital and anatomical variants, to further define the pathology. Treatment of upper limb varicosities is similar to that of varicose veins in the legs. The stab-avulsion technique combined with stripping of longer segments provides excellent cosmetic and functional outcomes. Welch and Villavicencio (1994) have described three cases with symptomatic upper limb varicose veins. 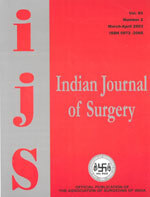 Surgical treatment was similar to that for lower limb varicose veins which entailed ligation and stripping of the varicose veins. Ligation and stripping successfully eliminated the varicosities with prevention of recurrence during a mean follow up of 17 months. Sclerotherapy with agents like Sodium Tetradecyl Sulphate and Polidocanal remain a useful alternative to surgery. The treatment of varicosities due to upper limb A-V fistulae is usually surgical and entails either ligation of distal venous limb of a side to side fistula or division of the fistula itself. In conclusion, although primary varicose veins of the upper extremity are extremely rare, they can be readily diagnosed and successfully treated surgically similar to lower extremity varicose veins. We are thankful to Dr. Sandeep Jhanjee and Dr. Neeraj Aggarwal (DNB Post Graduates) for their help in preparing this manuscript.